Can I assume the conditions is identical with the current one? If yes, don't you feel strange that the precipitate is not "reproducible"? I hypothesize that the precipitates will only form when there is a reduction of volume. Thats the reason I suspect it might be due to your PCR tube leakage. But then, I could be wrong. Not sure whether you interested in doing, but you can try poke a hole at the side at your PCR tubes, or intentionally loose capping your tubes, and re-run the 1-5 reaction again to see whether all the 5 tubes is having precipitates. I suggest you to use KOD xtreme hotstart polymerase if everything fails. Not tried on 12kb genes yet, but did tried a ~9kb gene and is working for me. Edited by adrian kohsf, 16 March 2011 - 08:17 AM. the 5 band is smeary despite is not as evident as 4...I will do without an autoclavated tubes but then, why there is no precipitation in the conditions with Taq platinum buffer? Hey OP, I don't know if you have fixed your problem, but I have been having issues lately that are very similar to what you experienced, and I discovered some stuff that could also be of importance to you. I needed to PCR a 3.7kb fragment from a plasmid (10kb) with primers that had 10-15bp overhang. Lots of AT, so annealing temp was low (45-55, according to different online calculators, i picked 50). 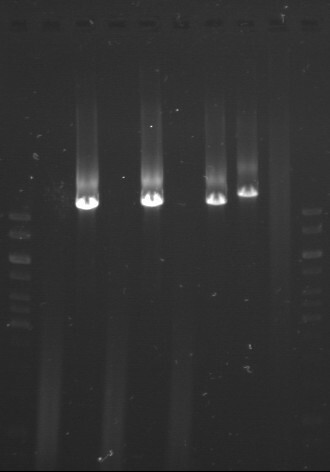 Refer to the attached photo, I did the PCR a couple of times and this was the last time it failed. Tested all the Pfx polymerases we had with different Mg2+ concentration. All our mixes without the template are prepared in a prePCR lab. The I proceeded unscientifically; I changed a lot of things at once. The template I was using was diluted with MQ that I also used for adding to the blanc (as much as the template, 1ul). I made a fresh maxi of my template plasmid, solving it in MQ that I took from the PCR lab. I re-made my dNTP's in the PCR lab. I made new primer solution. Now I see bands (at the right height)(see photo 0704: lane2 = blank, 3, 4, 5, 6 10E-4, 10E-3, 10E-2, 10E-1 dilution of template and lane 7 = 1ul = 800ng of template). So yeah basically for me it doesn't really matter what template dilution I use, or how many cycles I run. It also doesn't matter if I leave it overnight (it seems to even improve signal strength of lower dilution bands). Pfx50 does not do what it's supposed to do: there's smears in both lanes and no band. I also don't see any primers? I am curious about the contamination; I will do the taq PCR again this time adding different components of the Pfx50 mix to it (basically only two; the Pfx50 and the Pfx50 mix), with and without template. Also, next week I will test Phusion polymerase I got from a friend, and we got new Pfx platinum that I will also test. Regarding your issue, at least you have worked out your PCR reaction. You have not mentioned anything about your template (spectroscopic ratio, band in a gel, etc.) but seems that does not matter because you made it with Taq polymerase! Yes, even though it was nice confirmation to make it with taq, I still need an enzym with better proofreading (I want to investigate different snps). I tried the new Pfx platinum polymerase, but got smears in my sample and my control. Then I tried the PHUSION polymerase, which worked fine (and faster!) @ tm+3: I got my band as well as several smaller, non specific bands. I repeated this with higher annealing temperature, kept the non specific bandsand lost my band of interest. This gene is very resistant to cloning, it seems! I see if I can make it now by using my band produced by PCR as template for a new PCR with PHUSION. I don't have much left, but maybe enough for 2 more reactions. Probably you are right. If I fail with the new kit (and new batch)I will move on into a different polymerase! I had the same issue with a white precipitate appearing in my samples only after the PCR was complete. I consistently saw it several times but I still don't know what it was. I was using Roche Expand Long Template kit to amplify 12kb (unsuccessfully) of mouse genomic DNA. The precipitate disappeared when I used a different template DNA. I have finally sorted out the problem with the long PCR! Last week I received the new kit of SequalPrep from Invitrogen, a new batch one. And this time, from the beginning everything has worked out. I have had no precipitation and the amplifications have been almost perfect. The only things I maintained from the previous PCR were the primers and the water (the rest of the components were from the new kit) being the DNA template also new (a new genomic DNA purification with the previous used DNAextraction kit). The astonishing thing was that I have done a PCR reaction with the previous buffer, the one to be suposed to be wrong, and I haven't got any precipitation at all. Moreover, I could even visualize the expected band (not shown). So I really not sure what had been happening. But the point is that I see the bands and that I've been able to get rid of the precipitation!!!! Thank you for all the comments and advices, I really appreciate them!! Based on the info you gave, it looks like something has happened to your template DNA, it might have been sheared during freeze-thaw. Alternatively, it could be that enzyme is not efficient anymore (could you increase extension time?). To test if it is your DNA, do some controls (other long regions that you may have primers for) and borrow some DNA from someone else (preferably fresh). To save time, you may want to use a new tube of enzyme (if you can). I would also re-measure template DNA concentration (it might have increased?). If it is increased, dilute in some pure water (this will also dilute out any impurities. Which reminds me to tell you that you may want to increase you PCR reaction volume (for the same purpose). If you are doing 25, or 50 µl reactions, try 100 µl reactions but use the same volume of the template. I assume no contaminant has been introduced since last time your PCRs worked. A lot of factors can cause smearing. I´ve been performing a long PCR determination of coagulation factor VIII intron 22 inversion (with SequalPrep kit from invitrogen (A10498)). In the beginning everything was fine and I could manage to amplify the corresponding bands (of 12 kpb in wild-type or 11 kpb in inversion positive patients). 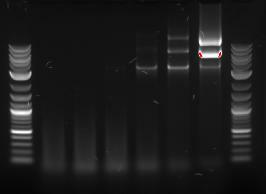 But suddenly an strange thing happened: in almost every PCR I tried, I got smeary bands in the agarose electrophoresis. I realized that the smeary weird bands were the consequence of the presence of some kind of white precipitation that appears in the PCR tube after the amplification. The point is that I didn´t change anything in the sample preparation (I previously had done aliquots of buffer, primers, enhancer that I thaw in the moment I need to prepare a PCR reaction). I use the same small room for DNA extraction, prePCR manipulation, postPCR manipulation; the question is, do you thing am I experiencing any kind of contamination? Can sample,primer, buffer or whatever contamination produce the precipitation inside the thermocycler in the PCR? I attach a photo of an agarose gel in order you could visualize those weird smeary bands! Thank you in advance. I had a smearing problem at one point too. I think the problem was that the sample I was extracting DNA from was too old and began degrading.